I don't know how many more posts will be used to torture you with Christmas themes. Thanks to my day gig, I'm running on empty in the idea department. This was a great display...as usual for u. I am very drawn to minimalist designs and this scene was very inspirational. I love the take on the non-traditional tree with the gifts below. The residents don't have to worry about tangled strings of lights or delicate ornimants to store away. Where is the chair from? Hey Lo Mandy! The chair is from Reac Japan. Check ebay. Great Modern Christmas...and I never tire of any of your ideas! What is the flooring? Looks like Southern Pine with a stain? I think the flooring is Redwood with a varnish on it. No worries about getting us bored with Christmas theme, all I can say is 'keep them coming'. I am on maternity leave now (we have up to a year here in canada) and any new post of yours amuse me. Luv them all. Whoa! A whole year of maternity leave!! That's more like it. What about paternity leave? And--CONGRATULATIONS on the family addition. You have such awsome talent!!!! I found your website about 2 months ago and have been hooked every since...what a great find it was!! It's getting so that I can't wait to get the computer from my 8 year old son to see what your creative mind have accomplished. Thanks for all you do and keep up the GREAT work!!!! Tks MC. Technically, 35wks out of the 52wks are classified as parental leave ... either one of the parents can opt to take, but it's the mother that usually takes it so we often refer it as 'maternity' leave. We are eligible to receive employment insurance. Although it's a huge decrease in household income to some (equals decrease in miniature budget ... hehehe), but at least our jobs are secure at least until you return to work. I know it's sooo off topic, so feel free to not post this comment if that's what you prefer. T.Dianne, I'm flattered. Thanks much! At least now I know who to contact if an 8-year old boy sends me complaint letters. Smiles. VWong, This whole blog is consistently "off topic" so no worries--Ha! Congratulations on a great year! Looking forward to next year. Let's see if I continue doing this blog next year. Ha! Do not scare me like that! You have to continue...what would we all do for the latest in Mini Modern info? I do have a life, and a good one, but your blog is one of the highlights of my day...especially when you put up something new. Hoping you were just kidding. This is a great room, love the zebra rug! where would one find one of these? Typically I only see tradional or oriental rugs as a mini. 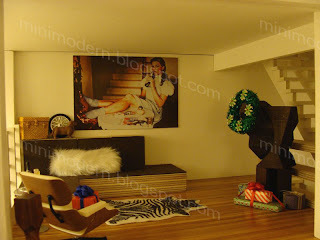 The zebra rug is from Lundby, but you can probably find one with a Google search. Also, Paris Renfroe has been selling real animal rugs in 1:12 on ebay.